NEW YORK: PepsiCo's SoBe has launched an immersive, cross-channel marketing campaign, called "Try Everything," encouraging young people to seek adventure and new experiences. NEW YORK: PepsiCo's SoBe has launched an immersive, cross-channel marketing campaign, called “Try Everything,” encouraging young people to seek adventure and new experiences. The campaign is using events, social and digital media, and advertising to introduce the Generation Y demographic to SoBe beverages. "The focus of the campaign is to engage people with the brand through fun, out-of-the-box experiences," said Elisa Quackenbush, communications manager at PepsiCo. The company has set up a microsite with links leading to various online activities, such as getting a virtual tattoo, where visitors can upload a photo of themselves and sample different tattoos. Frequent tweets, a Facebook page, and videos will promote the microsite and live events scheduled in six cities across the US. “The brand tries to embody an adventurous spirit – the more chances you take, the more chances you have to discover something you love,” Quackenbush said. Weber Shandwick is handling PR. Quackenbush did not disclose the budget for the campaign but said it is the brand's biggest effort since 2008. The program's launch is timed with the release this month of two new SoBe flavors, Goji Pear Yerba Maté and White Peach Oolong Tea. 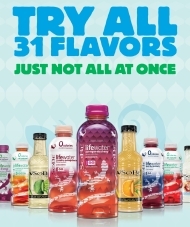 The first live event is May 25 in Madison Square Park, during which celebrity guests Kate Upton, Hilary Duff, Bernie Williams, and Jessica Szohr will challenge fans to attempt new activities and sample SoBe flavors. Beginning June 3, SoBe will hit the road with additional events in Los Angeles, Chicago, Denver, Portland, and Seattle. The campaign officially began on May 18 with a television ad in which Los Angeles Angels of Anaheim pitcher Jered Weaver pitches Fuji apples instead of baseballs. The next ad will feature Upton, Sports Illustrated Swimsuit 2011 Rookie of the Year, challenging people to staring contests.